Antimicrobial resistance (AMR) is one of the biggest threats to health across the globe to emerge for many years. The human and economic costs of AMR are already massive: the recent independent international review undertaken by Lord O’Neill amr-review estimated that if we do nothing to stop its spread, today's already large 700,000 deaths every year could become 10 million – that is more people than currently die from cancer. By 2050, the cost to the global economy will be around US$100 trillion. We risk returning to the pre-antibiotic era, when infectious diseases were responsible for around 40% of all deaths, and where our inability to treat common infections with antibiotics will render many modern medical advances dangerous, including major surgery and cancer treatment. However, AMR is not new. It has been understood for many years. Indeed, Alexander Fleming drew attention to the possibility of AMR when accepting his Nobel Prize for Medicine in 1945. There have been many attempts to address it. The first World Health Assembly resolution on AMR was agreed in 1998; the EU and the UK published strategies in the early 2000s. Yet, despite these efforts, resistance and, consequently, deaths, were increasing, a problem exacerbated by the fact that there had been no new class of antibiotic brought into clinical use since the 1980s. It was clear that there was no simple solution and that the problem needed to be tackled on a number of fronts. The challenge is to stimulate action across a wide range of sectors, adopting a fully integrated multidisciplinary and cross-sectoral approach, for humans, animals, agriculture and the environment. Using the role of Chief Medical Officer (CMO) for England has enabled us to become champions for AMR in the UK and across the world. The CMO annual report in 2013 called for action across all sectors, human and animal health, industry, academia and research funders. That call was reinforced in a comprehensive cross-government UK AMR Strategy published in September 2013. The UK, continues to champion AMR and the CMO is a figurehead. In practice, implementation of AMR strategy in the UK has been overseen and driven by an interdepartmental steering group. The Department of Health (DH) chairs that group and coordinates the approach with key partners, Public Health England (PHE), the Department for the Environment, Food & Rural Affairs (Defra), NHS England and the Devolved Administrations. The lead partners, in turn, work with other departments and agencies, professional bodies, industry and the research community. Coordinating delivery of the UK strategy across such a wide range of organisations has not been without its challenges. Early on, when the detailed implementation plan was in development, many health sector agencies were newly established and still finding their feet. Partner departments and agencies have different approaches to project management, different priorities, stakeholder groups and levels of resourcing. There was no new funding for implementation when the strategy was published and departments have had to determine how to deliver their commitments within existing funds. The DH team has had to navigate sometimes choppy seas where DH is ultimately responsible for delivery of the programme on behalf of the government, while needing to acknowledge the prerogatives of its partner departments and agencies. An additional complication is the fact that, although this is a UK strategy, each of the Devolved Administrations has responsibility for implementation within their own jurisdictions in relation to human health, while Defra has UK-wide responsibilities in relation to animal health and the environment. In addition to these challenges, the evidence in relation to resistance, its growth and transmission has continued to develop and the implementation plan has needed to continuously evolve in response. Progress includes a reduction in the prescribing of antibiotics for humans in England by 4.3% between 2014 and 2015, and a reduction in the sales of antibiotics in the animal health sector in the UK by 9% from 2014 to 2015. This country now has one of the most comprehensive surveillance systems in the world, to identify problems early and take action. There are unprecedented levels of research collaboration and increased investment. 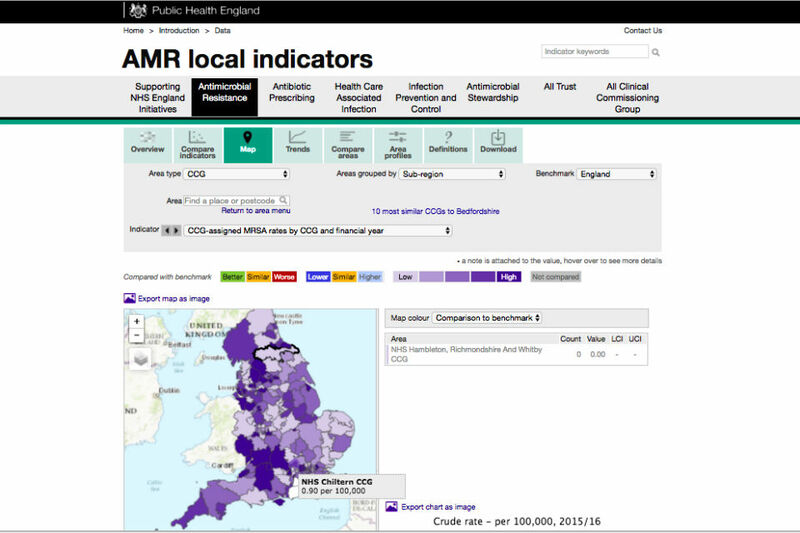 In the last year, PHE has overseen the development of a data-sharing website called ‘Fingertips’. This makes relevant data easily accessible to clinicians and the public and allows local areas to compare themselves to other similar areas. The Fingertips data portal is crucial in supporting local teams to deliver the new ambitions for the reduction in inappropriate prescribing and gram-negative infections and the use of antibiotics in animals, announced earlier this year. Gram-negative bacteria are a particular concern because they are resistant to multiple drugs and are increasingly resistant to most available antibiotics, they can cause pneumoniae, bloodstream infections, surgical site infections and meningitis. Of course, one of the biggest challenges domestically is to change behaviours: a third of the public believe that antibiotics will treat coughs and colds; and one in five expect to be prescribed antibiotics when they visit their doctor. Work will continue at national level to raise awareness, and at local level to support doctors to improve their prescribing. All of this domestic work would be of marginal significance if AMR was not addressed globally, and that has been the greatest challenge. There is recognition that while all countries need to act, many will have other priorities and low levels of capacity and capability. However, the UK has led the way, building international coalitions, raising awareness, and encouraging and supporting other countries to take action. One key message was important from the start: the need for access not excess. This recognises that, in many countries, lack of access to antimicrobials still kills more people than resistance. Accordingly, UK funding initiatives have focused on low- and middle- income countries to help develop their capability and capacity to respond. To galvanise global action, collaboration with other government departments was broadened, setting up a cross-Whitehall group chaired by the Foreign & Commonwealth Office (FCO), and bringing together partners from the FCO, DFID, Treasury and Cabinet Office, as well as DH and Defra. That group had clear and ambitious objectives – so ambitious many doubted it was even possible. Every opportunity was taken to promote AMR with governments in other countries and international bodies through international networks. This included work with like-minded countries to amplify key messages and using global partnerships like the Global Health Security Agenda to build consensus with other nations. The aim was to strike a balance between being perceived as telling other countries what to do and empowering them to take action. In May 2014, with partner countries, the UK secured a World Health Organisation resolution requiring member states to develop national plans to address antibiotic resistance. This was followed a year later by a Global Action Plan (GAP). That plan gives the world the blueprint for action needed to tackle AMR. However, implementation of the GAP requires much greater cross-sector and international collaboration. Key to achieving this is gaining political support at the highest level internationally, making the case that AMR has social and economic consequences that have to be addressed is crucial to delivering of the UN’s Sustainable Development Goals. The period since GAP has seen a series of international communiques, declarations and strategies, culminating in the G20 and UN General Assembly (UNGA) in September 2016. At G20, the UK secured commitments to take forward work to explore how to mitigate the spread of resistance and promote further research and development into new antimicrobials. At UNGA, 193 countries agreed an ambitious political declaration to tackle AMR. This was only the fourth time that a health topic has been discussed at the General Assembly and, as such, is a significant achievement. The challenge now is to turn the commitments made under the UN declaration and the G20 agreement into international action. There will now be a pause to allow the UN organisations to look at the options, while continuing to influence through and with the G7, G20, WHO and the UN General Assembly. There is have no doubt that much of the success to date, both domestically and internationally, is the result of lead departments working with experts, each other and across sectors to develop and implement policy. The UK has demonstrated its ability to move quickly to establish cross-government teams focused on specific initiatives and objectives, and to support senior officials, ministers and the CMO to galvanise the support needed to to make a difference to this international problem. The challenge now is to sustain this momentum, recognising that we, and the world, still have a long way to go to tackle the global threat of AMR.